We all used to think fat was evil. Something ingrained in us by the bombardment by the promotion of low-fat dietary guidelines, low-fat branded products and “fat is bad” marketing campaigns. 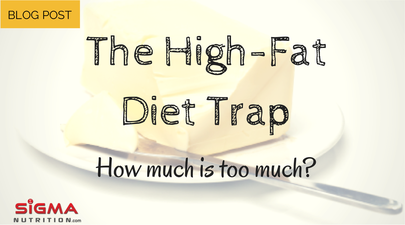 We fell into a low-fat diet trap. But thankfully the tide has started to turn. I think it’s become clear that dietary fat is not “bad”. Neither is saturated fat. The after-effects of the scaremongering around fat intake means that many people need to actually increase their fat consumption. And science-driven coaches, nutritionists and researchers are warning people not to buy into the “anti-fat” dogma. Many people now realise fat isn’t the devil and they’ve increase their fat intake, usually in tandem with dropping their carb intake from refined carbohydrates. The result? Often, many see a dramatic improvement in health. This doesn’t mean carbs are bad. We need to look at the context of why this particular person saw an improvement in their health. While related, I think each of these deserves its own discussion so in this post I’m going to look at point #2. Lower-carb, higher-fat diets are beneficial for many and are certainly better for health than the high-carb, low-fat diets that we see advocated by food pyramids and plates. But does that mean we all should be eating super-high fat intakes? Do we all need to be drinking butter in our coffee each morning? Should every meal be doused in olive oil? Can high-fat become too high? I see traps like this occur in nutrition a lot. And in all honesty I’ve fell into them before. Most of us have. And I get it. It’s so tempting when we find something that works really well, that to get even more benefit we just have to do it even more. But that’s a dangerous trap. Things don’t always scale linearly when we’re talking about human biology. We see it with people going low-carb. Low-carb diets are a great move for lots of people, especially if they have an underlying metabolic derangement (say they’re pre-diabetic) or are significantly overweight and likely (but not necessarily) both insulin and leptin resistant. However, just because it reducing carbohydrate load is a beneficial, it doesn’t mean the lower the better. Very low-carb diets can work great in certain situations but they’re not for all the time and certainly not for everyone. Yes, if you go move some heavy weight around, it’s a good thing. But it doesn’t mean to get even better results you need to just do more of the same. In general, there is an inverted-U response curve that illustrates the relationship between training volume and health benefit. So, with regards to fat intake, could some of us be falling into a similar trap as those that we criticise for falling into with other things ? If we tell people that EVERYONE should eat a low-carb, high-fat diet then yes, we absolutely are making a mistake. The whole concept of biochemical individuality should make that obvious. Yet we still have people demonising carbohydrates. Ok, let’s think about biochemical individuality. There are so many processes that may be running less optimally in one individual than in another. Maybe you have poor lipase production (enzyme that breaks down fats). Or poor bile secretion. We’re not talking anything too severe but maybe just enough for you to have a more difficult time digesting and assimilating fat. Or perhaps you’re one of the growing number of people who had a gallbladder removal. Of course you can still eat fat and you don’t have to go super low (especially with some smart supplementation like using Ox Bile supplements, etc.). But many of these guys and girls will do well by being more moderate in their approach to fat intake. Or how about one group we’ve heard all about: athletes. If you are a high-end athlete performing glycolytically demanding work (i.e. at a power output that is high enough to require lots of ATP to be spat out quickly via glycolysis) then you will need glycogen stores to perform optimally. You will need carbohydrates to perform optimally. But with all them examples, someone could probably still do a LCHF diet a be fine, provided they tweaked some things: the poor lipase producer can supplement with digestive enzyme, those with gallbladder issues can add in an Ox Bile supplement, and the athlete can cycle carbs in before priority training sessions or competition. However, there’s other issues we cannot get away from. 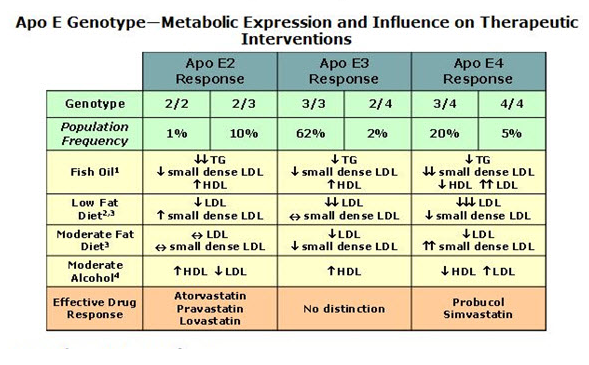 Perhaps the most important is in relation to the apolipoprotein E (ApoE) gene. The ApoE gene has three allelic forms: ApoE2, ApoE3 and ApoE4. This can get pretty complex and there is much we still don’t know about these isoforms. But there is research indicating an important implication for fat intake. If we look at those with the ApoE4 phenotype, there have been links made to all sorts of disease states: Alzheimer’s, impaired cognitive function, atherosclerosis, and cardiovascular disease, among others. And it seems like a high-fat diet is problematic for these people. There’s also been anecdotal reports from Dr. Spencer Nadolsky about the sky high LDL particle counts (an advanced biomarker for CVD risk) he sees with a number of patients eating a diet extremely high in fat, especially saturated fat. I will dive into more of this apolipoprotein stuff in a later post and talk about what markers to look out for. So, it’s not all quite as straight forward as “less carbs, more fat” regardless of the situation. Again, it’s my favourite word… context. If you don’t feel great on a high-fat diet, you might want to check it out. And getting a blood panel drawn a few times a year is a smart move for everyone, regardless of your dietary habits. As always, a blog post can should never be used to tell you: “you need to follow this approach” (that’s a big red flag for BS if you see such a post). All it can do is highlight some of these issues, highlight the need for context and give you an appreciation that drinking butter isn’t perhaps best practice for everyone!